As the Chairman is a Fellow and Member of the Council of The Royal Philatelic Society London, the Society is able to ask some of the foremost philatelists in the country to come and give displays at Aylesbury. This was demonstrated at a couple of the meetings which were held towards the end of last year. 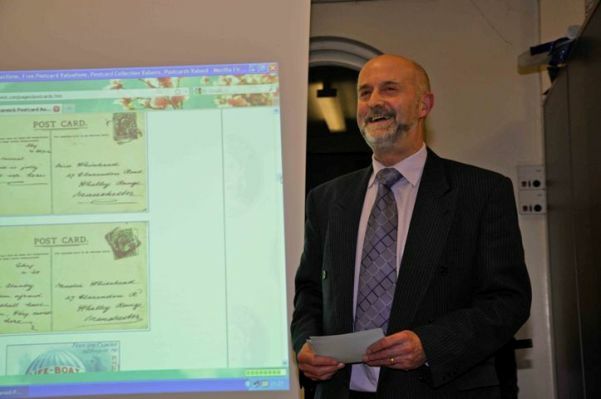 In October 2005 the Society was given a display of European Postal History by Gavin Fryer, who is a past president of The Royal and the winner of a number of gold medals in international competitions. His display started in 1840 with Penny Blacks and Twopenny Blues and included many unique items from the countries of Europe issued during the 19th century. In December 2005 there was a special Christmas meeting at which Alan Griffiths (a Fellow and Council Member of The Royal) who was awarded the Congress Medal earlier last year for his services to philately gave a display of items from his collections of Prince Edward Island and Queensland. These covered a period from around 1840 to 1912 and represented the results of a collection, which was started more than 40 years ago. It was a fascinating and entertaining evening. The Society has continued to enjoy a programme of excellent speakers during 2006. 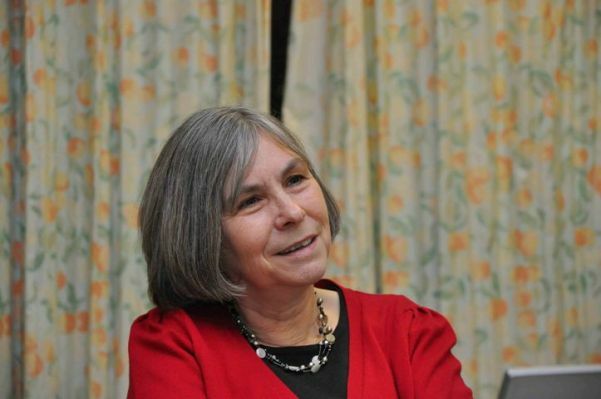 Susan Oliver came to see us in May and gave a display on the stamps and postal history of the Faroe Islands, which have fascinated her ever since she was a schoolgirl. The mystery speaker scheduled for July turned out to be Giles du Boulay, who arguably has one of the most extensive collections in the world of the stamps and postal history of Danzig. His display commenced at the start of the First World War and ended in 1939 when the Germans invaded Poland. The meeting in September was devoted to Local Postal History. This was a splendid evening when members brought along items from their collections from the 1750's up to the current day. A number of unique items were shown which included rare mileage marks of Aylesbury which were used in the early 1800's. The members of the Aylesbury & District Philatelic Society turned up in force at their November meeting to enjoy a display of GB Postal History given by Michael Lockton who is a well known figure in the philatelic world. 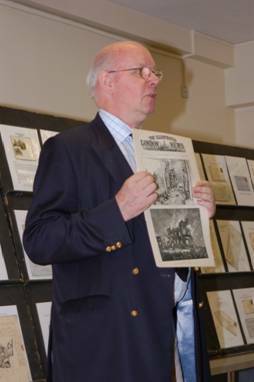 Michael divided his display into two sessions which were in complete contrast to each other and demonstrated the wealth of GB material which is available to the postal historian. The first session concerned the postal history of Exeter and ranged from the earliest known letters sent during the 1500’s up to the present day. His display covered the pre-stamp period with a number of unique items from the Corsini correspondence and the introduction of Uniform penny Postage was well illustrated with a penny black on a letter posted in Exeter during May 1840 and some Mulready letters. Michael’s second session was designed to demonstrate that the postal history of tomorrow can be found in the wastepaper baskets of today. The display concentrated on the use of Queen Elizabeth Machin stamps to pay the postage rate for which they were issued. This meant that each cover displayed only had the one stamp which was the correct rate for the service being used. Michael’s display covered every value of stamp issued since decimalisation from the halfpenny to the £10 value and showed that a fascinating display can be produced at a relatively low cost from contemporary material. The construction of a display of this nature requires a sound knowledge of all the postage rates in operation and of the services being offered by the Post Office; this includes Air Letter Rates, Forces Mail, Printed Matter, Registration, Recorded Delivery, European Rates and the Inland Services within the UK. It also needs considerable dedication to seek out examples of every rate which has operated during the past 40 years and it was clear that Michael’s family were under strict instructions when away from home to retain any envelopes Michael sent to them. 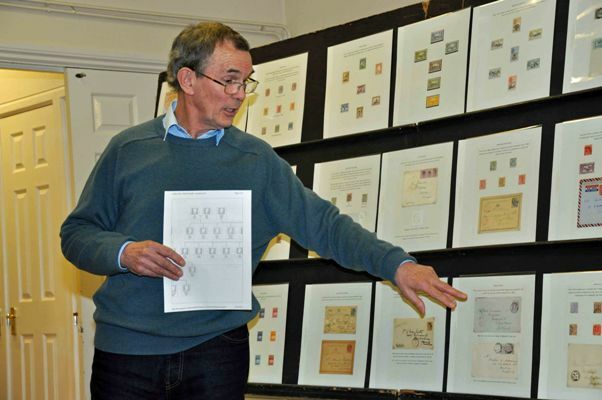 The Aylesbury & District Philatelic Society made an excellent start to the New Year by inviting Peter Lister to give a display from his collection of GB Internal Airmails which covered the period from 1911 to 1939. It was evident from the start of the display that we were listening to an expert on the subject of airmails and that the display being given was a representative selection from a huge collection which has been built up during the past 40 years. Many of the early letters were philatelic and designed to demonstrate the capability of aircraft as a method of transporting letters, but a number of flights which had been planned were delayed or abandoned as a result of bad weather and it was clear from Peter’s narrative that bad weather was a recurrent problem during the early days of flying. Peter showed many items which were unique and would be virtually impossible for a new collector to obtain unless an existing collector decided to sell his collection, but Peter pointed out that while many of the items on display were scarce, they were not expensive because there is a relatively small number of collectors interested in aerophilately compared with other branches of the hobby. As the use of aircraft for the delivery of mail increased some airlines produced their own stamps and the display included the largest known blocks of GWR Airmail stamps. The display contained a wonderful selection of photographs, numerous letters and even a silver cigarette lighter presented as a memento to one of the pilots who flew the first Aerial Post from Windsor to London on 16th September 1911. Peter was warmly applauded for an excellent presentation on a subject which introduced most of the audience to an entirely new field of philately. John Tingey started his display with some self composed poetry about a Gentleman by the name of Reginald Bray. The display that followed was a life history of this remarkable man. Mr Bray was an accountant born in 1876 and spent much of his life "experimenting" with the Royal mail. He would send any type of item through the post including such things as a Bee and Himself, On the first occasion he realised that by just posting himself, he had no evidence that it took place and so on the second time of posting he had himself "Registered" Mr Bray tested the postal service by writing the address in the form of a poem or writing it backwards or in the form of a picture quiz. Johns display included many Letters Postcards and items such as addressed shirt collars, that had been through the post, and many autographs collected by Mr Bray who at the time owned the larges collection on record. Members were surprised when john informed them that there was a lottery in Britain as long ago as 1560 but the most documented was the Lottery of 1736 which offered a prise of an Annuity, In 1780 the prize was a staggering £20,000 a huge sum of money for the time, A ticket cost the punter Half a guinea and involved much postal history as a receipt was issued to confirm your winnings or not even if it was to inform you that you had drawn a blank. The lottery in Britain finished in 1826 but a ticket for the Frankfurt or earlier Hamburg lottery was available. The modern lottery has raised over 300 million pounds for good causes to date and Johns material covered all aspects from the 1700's to today including a cheque from Lottery HQ. Hugh started collecting River Mail in 2002 and has built up an amazing collection mainly of covers which included Name of the boat cachets, other items included early maps and routes for mail by boat,horse or wagon. Hugh shows one of the boats used for river mail and freight. Geoffrey opened the evening by demonstrating how inflation affected the postal system with familiar British stamps and followed through with inflationary issues from around the globe, One of the most striking periods was demonstrated by the German Issues of the early 1920s when postage was increased by thousands of millions of marks. Geoffrey also demonstrated the confusion caused by increases of postage from one day to the next with first day of new postage issues on cover which showed some interesting cancellations. Four members traveled to Leighton Buzzard to entertain members of their neighboring society to a variety of displays . John Powell showed a good selection of Victorian material from the Gold Coast While Michael Pitt-payne explained with his exhibit the postal system between the United Kingdom and France between 1798 and 1890 with its very complex rates between the two countries, Graham Aylet showed Denmarks first stamp with 14 sheets of variants while Cyril Parsons gave his display - 50 years of G.B. postmarks which included examples from canceling machines, automatic letter facers, Slogans and examples of the two tier 1st and 2nd class system. A Visit from Maidenhead Philatelic Society. 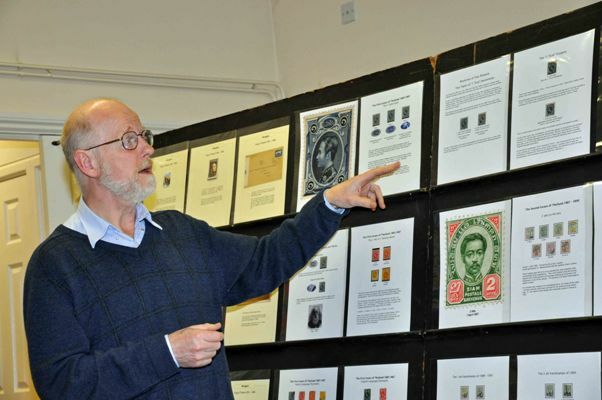 Three members of the visiting Society gave a varied display of General Philately starting with Tony Stanford with a fine example of the stamps and history of Zululand from 1888to the 1894 De la Rue Isse including post cards and postal stationery. Following on Edie Spicer displayed the history of the Man comien airmails of Colombia distinguishable from the large and small "C" postmarks, After the break Anthony Simmondes gave a varied display including The Turkish Empire,including Crimea war material, Registered mail of Nigeria and George V booklet panes. Tony Stanford concluded with Military and army Telegraph stamps of Sudan 1884 - 1902 Including telegraph forms and hand stamps. Michael Pitt-Payne rewarded each visiting members of the Maidenhead society with a bottle of fine wine and a enthusiastic round of applause from the Aylesbury society members. Gavin Fryer F.R.P.S.L. George VI. World War II. Gavin began his display with a cover which included four 1d scarlet definitives postmarked 9th May 1937 1 day before the official issue date,Heavy cancellations were applied in an attempt to disguise the mistake, Evacuation letters telegrammes and wreck mail were displayed dating from1939 and following on from this Internee mail from many foreign army and navy personnel in Britain. British stamps of King George VI were displayed on mail sent from abroad including such countries as China sometimes without success. overall there were almost 200 sheets of material on show, including some rare and some unique items.all giving evidence of what went on with mail in the era of King George VI. Gavin with heavily canceled cover from 1937. Christine Earle FRPSL The Post Office went to War. Christine shows a Booklet from 1995 featuring R J Mitchel and the Spitfire. Colin Such from the well known auctioneers Warwick and Warwick was assisted by his wife in giving a display of Postcards accompanied by stories of life as an Auctioneer. Following this Seasonal celebrations were shared by all those present.